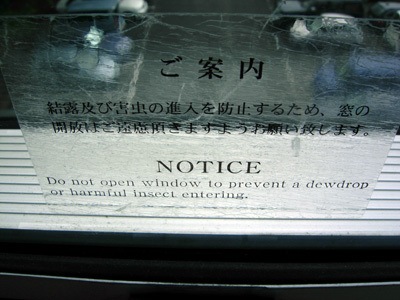 I'm glad Paalo read this - I don't like harmful insects though dewdrops don't worry me. There was a better sign than this written on one of the hotel restaurant's board and it stated that "photos contain images". We also have breakfast vouchers as part of the ticket and unlike the others, we use them. Breakfast is a large buffet offering western and Japanese dishes. You can enjoy pancakes and maple syrup with your miso and pickles if you so desire. I must say that the rooms are incredibly quiet even though we can watch planes come into land at the airport - thanks to the ultra thick glazing and insulation there's just silence. As we nothing else to do we decide to head to the airport early and check out the shopping. We've planned it quite well that the bus arrives just as we check out.